Captain's Log - "S.T.V. Eye of The Wind"
The Eastern dock basin at Southampton was a hive of activity as the class A and AII crews prepared their vessels for the first race leg of the Tall Ships 2000 voyage. Numerous tugs hovered mid-basin to assist the undocking of the fleet. Led by the magnificent Polish ship "Dar Mlodziezy" these graceful ladies of the sea shook out their sails, shouldered out into the Solent and bid Southampton farewell. To the delight of numerous pleasure craft and shore-bound spectators the grey overcast skies parted, giving them an excellent chance to view the fleet. On clearing the Nab Tower, in the Eastern approaches to the Solent, we were able to commence setting the fore and aft sails, soon followed by the fore-squares. With a favourable easterly breeze and the tide in our favour, St Catherine"s lighthouse was soon abeam. We waited anxiously, to see if the forecast south-westerly gales would materialise. As the light of the "Bill of Portland" was on our starboard beam the predicted gale came howling in. Under reduced canvas and hard on the wind we proceeded into Lyme Bay and by 0800 Monday we were at anchor off Brixham. It was certainly a dramatic introduction to the reality of life before the mast for our 22 newly arrived Canadian trainees, many of whom succumbed to the grips of "mal de mer" that night. We sheltered in Brixham for the rest of the day and prepared the ship for the first race leg scheduled to start from Plymouth the next day. The adverse conditions postponed the start of the race for 24 hours, but at noon on the 19th April everyone was finally ready. With only minutes left before the boom of the starting gun, the bare masts and yards of "Kruzenstern" and "Mir" were clothed in canvas and proceeded with foam at their bows toward the starting line. The new sail training brigantine "Stavros S Niarchos" was quickly left to port. As we crossed the line the Force 5 winds from the SSE began to veer towards the south. "Full and bye" on the port tack the class A and AII vessels picked up their skirts and bowled along. It soon became obvious which vessels could inch up closer to windward and clear the Lizard Point. We had a spectacular view of the Dutch vessel "Europa" as, with both our vessels evenly matched, she held station off our port quarter. For us the rounding of the Lizard under sail was not to be. Our first "ready about" was at 1600 north of the dreaded "Manacles" rocks, the final resting-place of many a proud ship. On the starboard tack eastward into the Channel we had a blustery and squally night. For some crews this meant retirement from the race as gear failed and sails were blown out. Dawn found us approaching the separation zone north-west of the Channel Islands. We made the port tack back to the west, hoping to gain a better track with the help of the tide and an expected wind shift to the south. Thursday 1800, we tacked again and sailed eastwards and by 0800 Friday we had gained sea-room to the south and the situation looked more promising. We came about and with the help of a favourable backing of the wind, we hoped to clear the Lizard and Lands End. As with all things nautical, time and tide serve no man and the wind duly swung back to the south-west. As we approached the Lizard for the third time, the force 6/7 wind that had kept us bowling along since Wednesday eased to force 3 and we felt ourselves in the grip of an adverse northerly setting tide. We gave up the unequal struggle, came about, shortened sail and heaved to until the next favourable tide. Midnight Friday found us again on the port tack with the Lizard light three points off the starboard bow. It did seem that at last we would leave that southernmost point of Cornwall in our wake, but it was not to be, and plagued by fickle light airs we made little progress. With the change in the tide pushing us ever closer to the inhospitable shore, we were forced to reconsider our strategy. "Europa" had returned to Falmouth with an injured crewmember, and more tales of retirements owing to broken gear came with each radio schedule. From "Jolie Breeze" we received the future week"s weather. It looked bleak. At 0600 the iron topsail came to life and we finally pointed our bowsprit to the south, toward our first destination, the historic Spanish port of Cadiz. Sunday midday found us west of Ushant with favourable winds giving us 24 hours of fine sailing, however as the wind died away, the next 24 hours required the services of our trusty "Gardner" main engine. By 1100 on Tuesday our first "soldiers breeze" had set in and carried us across the notorious Bay of Biscay. Since departing Southampton a series of low-pressure systems had swept in from the Atlantic or formed off northern Spain. The "Lord Nelson" was caught off La Coruña by a sharp depression which produced 50 to 55 knot winds and 8 to 10 metre seas! We were glad not to be in the vicinity. As we paralleled the Portuguese coast, the south-westerly gales persisted, until clearing Cape St Vincent, the wind set in from the east. After this eventful voyage, we arrived off Cadiz on the evening of Tuesday 2 May, and along with several of the other vessels of the Fleet entered the harbour on Wednesday morning, docking in this historic port, the starting point of many of the earliest voyages of discovery and also the site of more than one naval battle between the English and Spanish in the eighteenth century. The fleet continued to arrive through Wednesday with the stragglers all safely alongside by Thursday evening. The Spanish hospitality has been overwhelming with celebrations and revelry lasting well into the night. Many of the vessels opened their companionways to the public, and a vast throng of local people and tourists took the opportunity to visit the ships. Ahead of us lies leg two of the Tall Ships 2000 race. 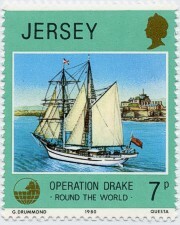 A passage of 3800 miles to Bermuda with a minimal 31 days allowed for this long Ocean passage. We will have our work cut out to maintain the 120 plus nautical miles per day required to arrive on schedule. As always, we hope for fair winds and calm seas, but prepare for quite the opposite!